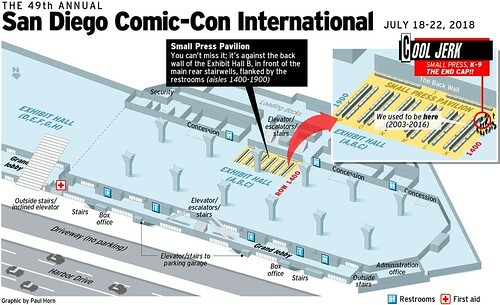 This year is the sixteenth consecutive year that Cool Jerk set up shop in Small Press at San Diego Comic-Con International (map below). The weather forcast says it’ll be muggy with a chance of drenched armpits. And that’s INSIDE the convention center! 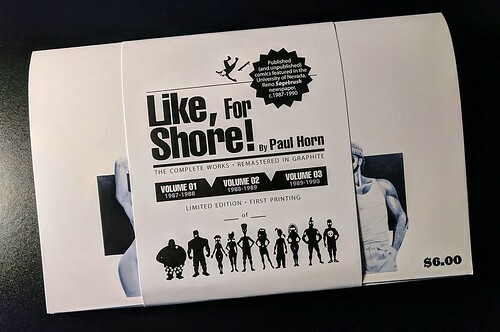 This year I have a special treat for all of you who have the complete Cool Jerk library: Like, For Shore! The Complete Works. It’s three volumes collecting more than 170 college-era strips that preceded Cool Jerk. Armpit, Puppy and the rest of the Spittle Beach gang are all there, and I remastered nearly every strip in graphite. 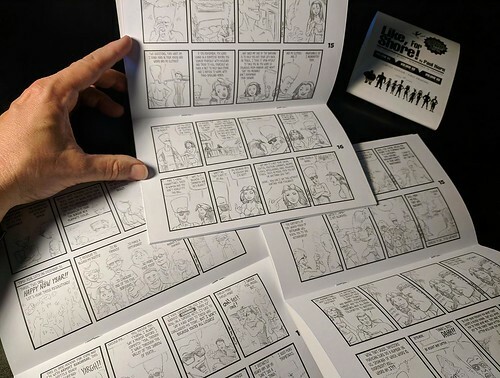 The first printing is in a very limited run of 75 signed and numbered copies, and San Diego Comic-Con attendees will have first crack at buying them. Sold as a set, $18. Also new this year will be a few new Canvas Panel designs, which I’ll Tweet during the show (find me on Twitter: @cooljerk). I also reprinted a stack of old favorites that always seem to sell out. $15 a pop, or $40 if you want a long-form canvas (contains a whole strip, not just one panel), which I can custom-make for you if you order one up in person or online. I have a limited supply of last year’s runaway hit, the Cool Jerk Enamel Pins. They’re $10 and you get one-of-a-kind original art with each pin. Choose among the Cool word balloon, Jerk thought balloon and/or the ubiquitous CENSORED bar… perfect for any jacket, backpack or tongue piercing! This year, I want to try something new. It could be awesome, it could be a giant mistake. If you’re reading this mailer and attending Comic-Con, ask about the Cool Jerk BOOK DEAL. It’s on the down-low; I’m not going to advertise it. But ask about the BOOK DEAL. Seriously. It’s totally worth it. Also worth mentioning are The Girl Who Kicked The Donut Habit (Darlene’s second comic) and the Jerkopædia (Official Style Guide to Cool Jerk), both of which I’ll have on hand. Also running a bit low on t-shirts, but I’ll bring what I have. Here’s a locator for your convenience. Thanks for following Cool Jerk and hope to see you at the show!